We have finally come to the third and final part of our SUTD series. So far, we’ve explored the similarities between SUTD and Yale-NUS College’s common curriculum, walked down the corridors of their hostels, and experienced their familiar, quirky, small school culture. On our final journey to the East, let us discover what makes SUTD unique. SUTD freshmores’ finals exhibit. Does this remind you of our SI finals exhibits? Last December, I visited a finals exhibit titled “The Technological Body” by SUTD ‘freshmore’ (SUTD’s equivalent of a rising sophomore) students as part of their Introduction to Design course. As I slowly perused the rows of impressive, actually functional prototypes, beautifully designed posters and videos, I couldn’t help but feel a sense of awe, and a little envy. Here were university students, ready to leave their mark in the real world. There were designs already on their way to receiving patents and others already expecting investors. These were a bunch of freshmores, who—through a lot of trial and error— learnt how to dabble in electronics, 3D modelling, prototyping, coding, marketing and branding. Each group had to incorporate design, and two of the following components: Physics, Math or Humanities and Social Sciences (HASS) into their projects. Very interdisciplinary indeed. 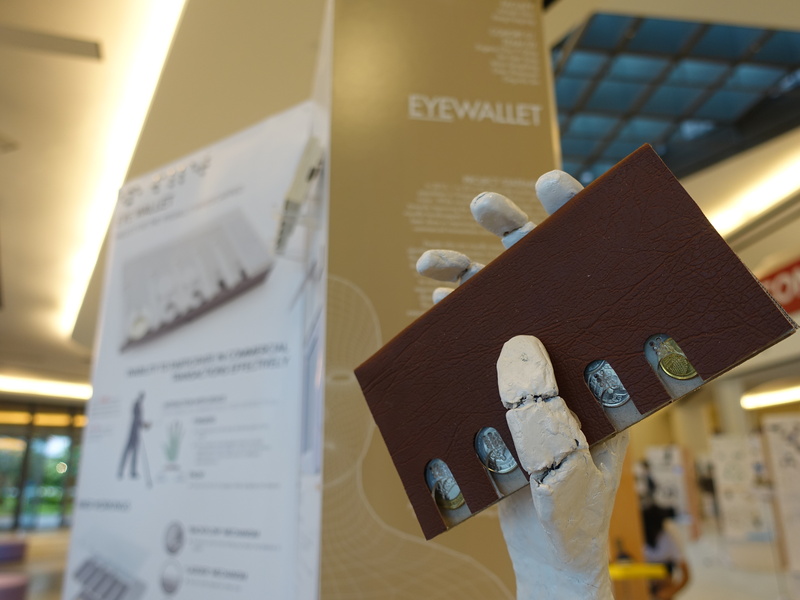 Eyewallet, a wallet for the visually handicapped (bottom) and the project file for Tuna, a device that alerts you when you’ve left your belongings behind (top). Students had to come up with innovative solutions to solve relevant problems today. Examples range from a wallet that helps the visually handicapped sort their coins, to an app that helps you learn languages through your phone camera, and to my personal favourite—a hoverboard-wheelchair that helps caregivers push wheelchairs around with ease. I saw familiar names like Karl Marx, Emile Durkheim, Sigmund Freud and Max Weber on posters explaining how the students’ designs solve problems related to modernity are linked to social theories like the iron cage and conceptions of the self. It was like a beautiful marriage between Modern Social Thought and Scientific Inquiry. The application of the social sciences in design and technology to help solve social problems is something a liberal arts school can relate to. According to Keith Teo, an SUTD student affectionately known as Kloo, some of his friends are even taking a gap year next term to go further with their current projects and start their own mini businesses. Some students have already succeeded in starting up their own businesses, chasing their dreams with support from the school. Examples include Bread Yard, a café that serves homemade bread and sandwiches. It was founded by Ivan Ting when he was still a student in SUTD. He says that he “feels that the startup vibe is strong in SUTD and hopes it continues to support the entrepreneurial dreams of its students.” The café started in SUTD itself, and has now shifted to Fusionopolis in One-North. This reminded me of some seniors here in Yale-NUS who wished not only to put the knowledge they’ve learnt here to use, but spread it to others as well. One example is Codegakko, a coding academy for students, was set up by a few Yale-NUS seniors. The company was founded in April 2016, and has taught up to 1000 students in 6 schools across Singapore and the Philippines. They are currently working on building a web platform for their learning programmes. The Zaibike Team. Photo by Zaibike and Indiegogo. 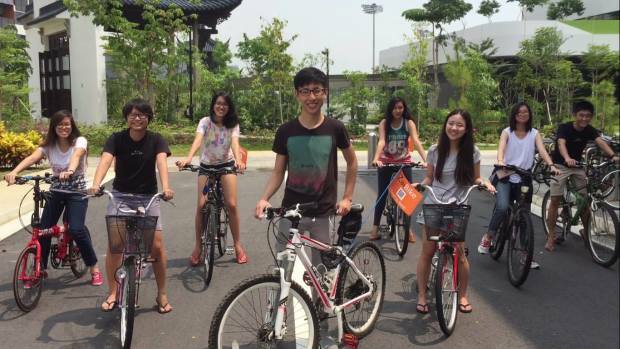 Another enterprising group of eight SUTD students, frustrated by the school’s distance from the nearest MRT station, and enthusiastic about making night cycling at East Coast Park a reality, came up with a bike sharing system called ZaiBike.With the support of the school’s research grant, professors and the student body, Zaibike has now ventured out to cater to offices and has also begun working together with Land Transport Authority (LTA) to conduct trials for bike related projects in the near future. Think about this the next time you fancy a night cycling escapade to West Coast Park. There is much Appreciation for the Arts. 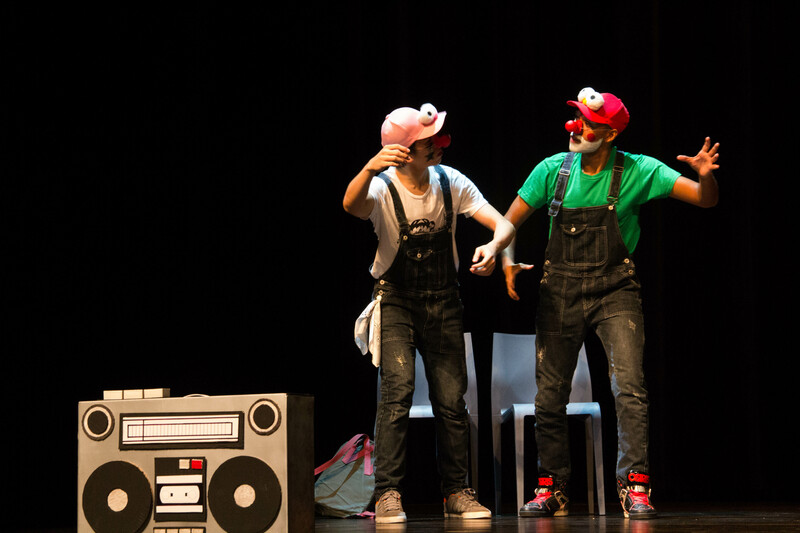 In addition to science and technology, SUTD students really appreciate the Arts. In October, my editor and I went for SUTD’s First Keys concert that was centred around a new Steinway-designed Lang Lang baby grand piano donated to the school by the Sing50 fund. 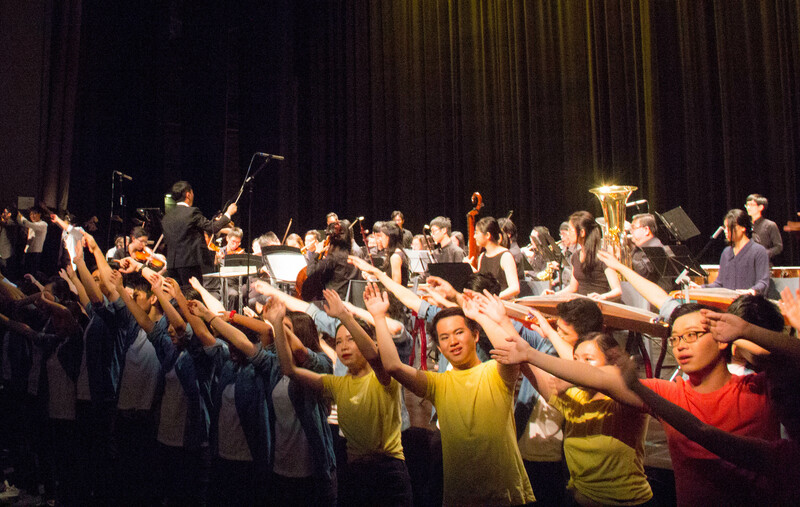 12 performing arts groups, a few individuals and faculty members put up a celebratory concert for this occasion. Finale of the First Keys concert. They had a concert. To celebrate a piano. If that’s not appreciation of the arts, I don’t know what is. SUTD’s President, Professor Thomas L. Magnanti, spoke about the importance of the arts and humanities in SUTD. “It’s not just about the technical education. 22% of our curriculum is built on the humanities,” he said proudly. Speaking to Kloo and his friends helped me get an idea of how much they appreciated having the arts and humanities in their school curriculum. “Prof Thomas fought for the Arts here in SUTD and we are very grateful for that,” said Kloo. This surprised me because I initially bought into the stereotype that these tech and design students would have less of an appreciation for the arts and humanities, just like how I’ve often heard some students here in Yale-NUS groaning about our Foundations of Science (FOS) and Quantitative Reasoning (QR) classes. For some non-science students here, such science and math subjects are thought to be a painful obligation. The three students fiddling with the piano trolley they’ve designed. 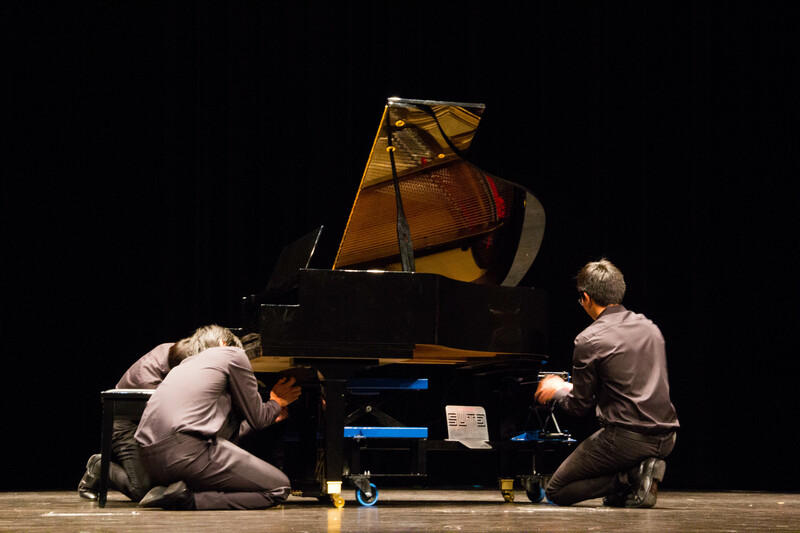 In the concert, the piano was then given a grand entrance by a group of three SUTD students who were also musicians. They spent months designing and building a piano trolley so that the baby grand can be shifted around with minimal impact. They were seen manoeuvring this intricate contraption around as they shifted the piano to different locations on stage throughout the show. Another group of SUTD students even designed a “piano-proof” music studio just to preserve the piano and protect it from the humid environment, and have rolled out the design to other schools who were also receiving baby grands. SUTD has managed to bring out the best of both worlds: technology and art. It was intriguing but also strangely gratifying to see these students make a big deal about celebrating and not taking for granted this gift of the arts. The night proceeded on with beautiful piano and violin duets, choir pieces, dances choreographed around the piano, fusion pieces between the Chinese Orchestra and Indian dancers and many more. It was truly, truly impressive. At long last, we’ve come to the end of this three part series. It’s been my pleasure to tell you more about the similar traits we share with this “distant sibling” of ours. From our common curriculum to our small school culture, our appreciation for the arts and beyond, I guess you could say that we are “same same but different”. Surely, my past 4 visits to SUTD will not be able to sum up the entire experience of what it is like to be a SUTD student, and my limited interactions with the students there would have colored the perceptions I have about SUTD and its students. Nevertheless, I hope that I’ve managed to acquaint you with this wonderfully humble, enterprising college. Special thanks to Multiverse editor Nabila Lasarati (Left), Keith Teo & Nicholas my editor (Right) and the dear friends in SUTD who’ve helped made this series happen. You guys made the trips to the East worth it. Photo on the right by The Gspot.